Jeff enjoys taking his kids to Washington Park, where they can run as wild and free as their little hearts desire. Jeff is two minutes older than his twin, Rick, and the latter is several inches taller. But Jeff usually beat him at one-on-one because he was quicker. Having a twin was good, he says, because he had always had someone to go up against. The two of them were quite competitive. Jeff says it was an advantage now that he’s an attorney. His father taught science and biology at Turpin. During summers, he coached his sons’ various teams. He was still running marathons in his late 50’s, logging his 14th by the time Jeff joined the Firm. From his father, Jeff learned the value of hard work. Another of Jeff’s heroes is his mother’s father, a non-denominational preacher who started a string of churches between Cincinnati and Indianapolis. He’d get one going, then move on after a couple of years to start a new one somewhere else. Growing up, Jeff was an avid newspaper reader. He had a natural curiosity about what’s going on in other places. His taste in books runs to non-fiction. He likes learning about people, their journeys and how they came to be where they are. He majored in journalism at Ohio University and thought he might become a sportswriter. But then he took stock of the newspaper industry, along with his particular set of skills, and made the logical, left-brain decision to go to law school. He and his wife, Natalie, began dating in the spring of their senior year of high school. They had a one-year-old daughter who was just learning to walk when Jeff joined Graydon. Now the father of 4, most of his free time is given to learning about being a dad. Jeff’s practice is focused primarily on bankruptcy and commercial litigation. 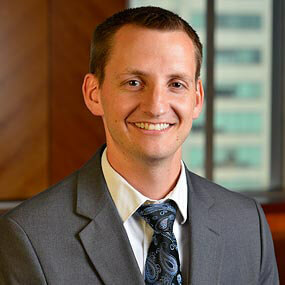 Prior to joining Graydon, Jeff worked as an associate in a Columbus law firm in the bankruptcy and litigation departments. Jeff is a 2010 graduate of The Ohio State University Moritz College of Law where he earned his J.D. and served as a member of the law review. He also earned a B.S. in Journalism with a minor in Political Science from Ohio University in 2007. Jeff and his wife both grew up in Cincinnati and now live with their four children in Hyde Park.